MTV changed up the game with the 2017 MTV Movie & TV Awards as this was MTV's first ever production honoring both movies & TV. The awards show, located in the venerable Shrine Auditorium in Los Angeles, featured a production design by David Edwards, Jr. of D Before E, Inc. along with art direction by Anthony Bishop of AWB Design, LLC. While it’s PBTVs first time working on an MTV movie awards show, we have worked with Bishop on a number of projects. 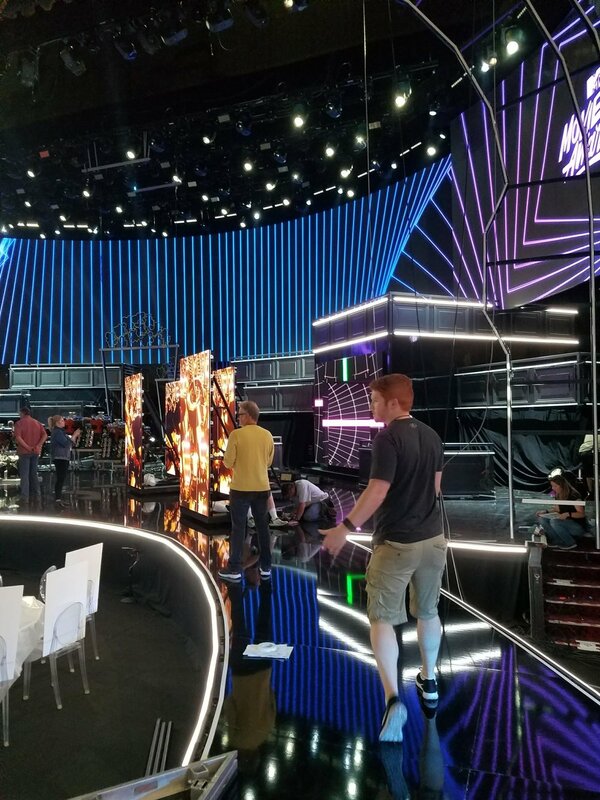 The LED video screens for the MTV Movie & TV Awards were a combination of digiLED’s DLPi 3.9 and DLPo 5.9 products. The upstage of the set featured a massive 80-tile-wide (130’+) curved screen with LED video products covering, both the inside and outsides of entry tunnels that were built into the screen. Working with digiLED’s creative products, the team from PBTV could fulfill the creative team’s design ideas. By employing the digiLED Variable Angle Connector (VAC) the LED modules can be attached and angled up to 15˚ in a convex or concave arrangement. Using the digiLED Right Angle Connector (RAC) and digiLED’s quarter-wide Mini Tiles, the PBTV team was able to make 90˚ connections paired with seamless video. With true right-angled connections, the creative team was able to wrap content around the outside—and inside—of the tunnels in the set. “We were able to use—for the first time—our little ‘mini tiles’,” explains Guy Benjamin, Vice President, Pete’s Big TVs. “These mini tiles are a quarter of a standard tile wide (125mm, 4.92” wide) which allowed us to make right angles for these tunnel effects. Where normally you're going to see the dark edge of a video tile where you make a right angle, with these new mini tiles you can make a seamless right angle with seamless video wrapping around the edge.” The digiLED DLPi 3.9 modules were used to follow the curves and to cover the opera boxes of the Shrine Auditorium on both stage right and left with ultra-high-resolution video.